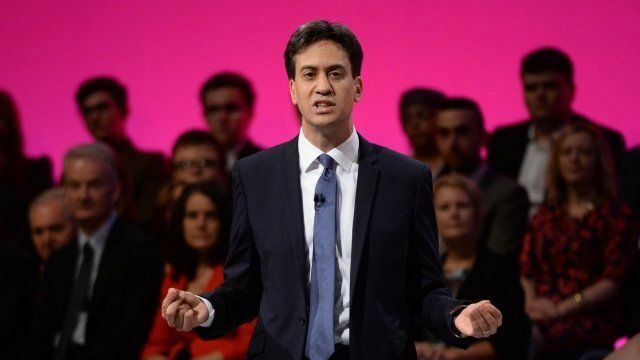 Miliband conference speech in full Jump to media player In his last conference address before next year's election, Labour leader Ed Miliband set out a 10-year plan to build a "world-class Britain". Clegg's conference speech in full Jump to media player Liberal Democrat party leader Nick Clegg's full conference speech delivered to delegates in Glasgow. Cameron conference speech in full Jump to media player Watch Conservative Party leader David Cameron's conference speech in full. Miliband's 10-year plan to 'fix' UK Jump to media player Ed Miliband has set out a 10-year plan to reverse the damage he says has been done by the Conservatives. In his last conference address before next year's election, Labour leader Ed Miliband set out a 10-year plan to build a "world-class Britain"
He said the next eight months would be "an interview with the British public for one of the most important jobs in the country".